The European Space Agency believes it may have found a supervolcano on Mars that could have been the Red Planet’s equivalent of Yellowstone. The massive Siloe Patera crater is 40km x 30km and drops as low as 1,750 meters. The rugged exterior of Mars is littered with holes; however, one in particular stands out. Siloe Patera, which is located in the Arabia Terra region of the planet, consists of two large craters that overlap each other. It covers a total area of 120sq/km. The images were captured on a high resolution stereo camera aboard the European Space Agency’s Mars Express craft on November 26, 2014. Supervolcanoes are defined as volcanoes that can produce at least 1,000 cubic kilometers of volcanic materials during an eruption. For instance, in April scientists discovered that a newly-mapped magma chamber below Earth’s Yellowstone is a monster, containing anywhere between 30,000 to 116,000 cubic km (46,000 cubic miles) of volcanic material. This is enough to fill the Grand Canyon 11 times. Scientists who’ve been studying the surface of the Red Planet believe that Siloe Patera is a caldera, which is the collapsed center of a volcano. Supervolcanoes do not have a cone shape, because the massive explosion that is triggered by enormous pressure in the magma happens too quickly. Therefore, this makes finding the location where a supervolcano erupted millions, or even billions, of years after the event occurred tricky. “A number of irregularly shaped craters have been detected in the Arabia Terra region that could represent a family of ancient supervolcano calderas,” the European Space Agency stated. “Siloe Patera is one such example. It is characterized by two depressions with steep-sided walls, collapse features and low topographic relief,” they added. The scientists believe this could be a caldera rather than an impact crater because the later tend to have uplifted crater rims and a central peak as well as ejecta blankets surrounding them. Also, the two depressions could represent two different eruptions when magma was released. There are also a number of small channels and gullies that are cut into the walls, which are visible when taking a closer inspection of Siloe Patera. A valley feature can also be seen. “The valley, along with numerous other small channels in the immediate vicinity, appears to cut through material to the lower left of the craters that could be either ejecta from an impact or volcanic flow,” the ESA stated. The ESA scientists admit that it is difficult to say for certain whether Siloe Patera is a supervolcano, as more data and high-resolution photographs would need to be acquired. 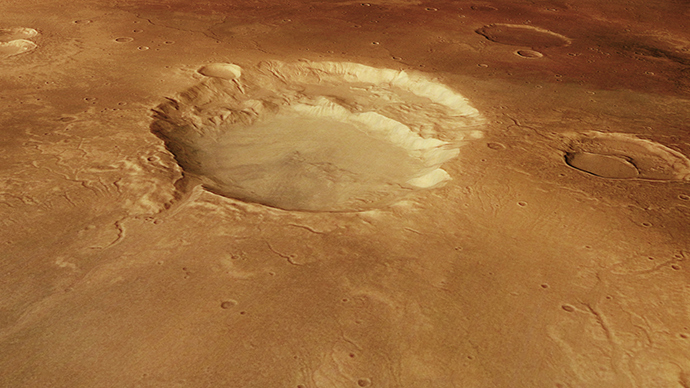 In October 2013, scientists believed they had found evidence of a supervolcano on Mars. They came across a volcanic caldera, which was named Eden Patera, which had a similar depression to Siloe Patera. The researchers, Joseph Michalski from the Natural History Museum in London and Jacob Bleacher from NASA’s Goddard Space Flight Center, said a large body of magma, which dissolved like gas, rose to the surface quickly through the thin crust. The said this would be similar to the carbonation in soda. Just like a soda bottle that’s been shaken, the supervolcano would have blown its contents over a wide area if the top came off.